Marvelling at the mural and mosaic covered temples of Luang Prabang is the next must-do activity after the early morning alms giving. There are 33 glittering temples — known as both wats and vats in Laos — in the ancient Lao royal capital so we decided to start by focusing on a few and seeing them with a guide. Our first stop touring the temples of Luang Prabang on Manomai Road was Wat Visoun — also known as Wat Wisounalat, Wat Visounnarath and Wat Wisunarat — named after King Wisunarat, who reigned during the temple’s construction in 1512. While impressive, the temple standing today, like most in town, is a replica, the original structure destroyed in 1887 when Luang Prabang was looted and burned by the Chinese (Haw) Black Flag Army. 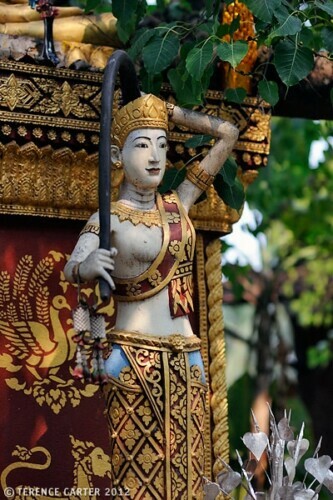 The only temple that wasn’t razed to the ground was Wat Xieng Thong, which he was saving until last. 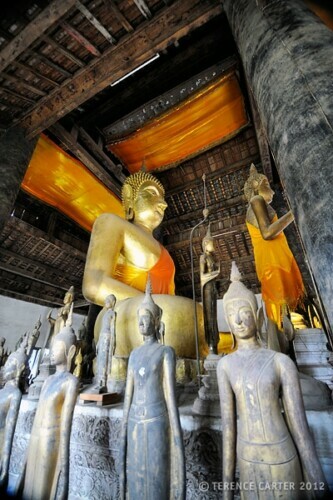 Touring the Temples of Luang Prabang. As we strolled the grounds, our guide Bounmee briefed us on Laos Theravada Buddhist rituals and customs. 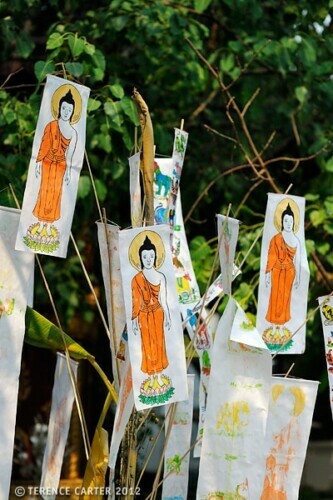 He showed us the paper Tua Paung flags that hung from poles poking into sacred sand pagodas that were made for the New Year Songkran celebrations. These miniature sand castles, decorated with flowers, candles and flags, are dedicated to Buddha as a form of making merit. The Tua Paung flags are decorated with pictures of eight animals — the lion, cat, garuda, cow, elephant, rat, naga, and tiger — representing the signs of the Lao horoscope, adapted from the ancient Brahman astrology of the Khmer. 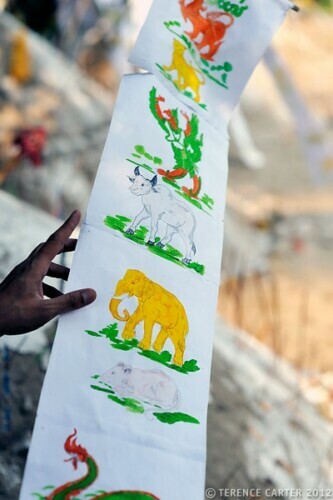 The Lao have a way to calculate which animal they should follow for that particular year. They believe their fortune relates to the animal, and the flags will bring them luck. Bounmee pointed out the different buildings that comprise a monastery temple complex in the architectural style known as Luang Prabang Style I, identified by the structural shape of the ‘sim’, the main building or ordination hall, which has multi-tiered roofs. There are also monastery buildings, where the monks sleep, study and eat, as well as a stupa called That Pathum or the Stupa of the Great Lotus, known by locals as That Makmo or the ‘watermelon stupa’, for its shape. Also destroyed, it was reconstructed in the late 1920s. We left our shoes on the stairs and entered the imposing building. The original sim, Bounmee revealed, was even more spectacular. Highly ornate, with intricate teak carvings, it had twenty-one windows with turned wooden balustrades, and a double roof with the top tier high above the lower tier, supported by twelve 30-metre high pillars. It’s thought some 4,000 trees were used in its construction. The new temple, reconstructed in 1897 with brick, plaster and wood, in the style of the original, is now an important repository of spiritual art, boasting a large number of antique gold, bronze, stone, glass, and wooden Buddha statues, the oldest dating to the 16th century. Bounmee explained to us that there are 49 Buddha positions, with different gestures given to Buddha in the sitting, reclining and standing postures. Here, many of the statues are standing with their right hand raised, which is the teaching position. Almost as compelling as the statues were a few teenage girls in school uniforms, who arrived to excitedly make offerings between giggles. Each girl knelt down and placed at an altar two candles, three incense sticks, water coloured yellow by turmeric, and a frangipani, and made a wish. I asked Bounmee what he thought they were asking for. “Health, luck and a boyfriend!” he laughed. Next, the girls moved to another altar by the entrance where they knelt for a spot of fortune telling, a practice that originated in China called Kau Cim. They shook a cylindrical bamboo cup full of sticks in such a way so that one slid out. The teens checked the number and then removed a card with the corresponding number from the altar to discover their fortune. The girls would go to nine temples for good luck, as is the ritual over the New Year period, Bounmee said, hoping that one of the sticks would reveal the future they were wishing for. 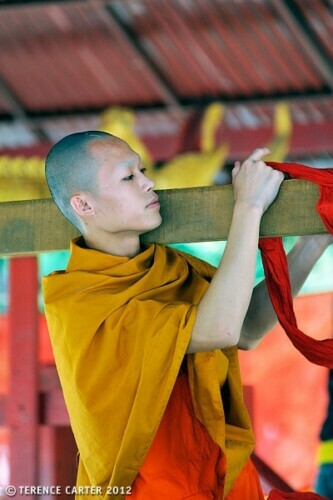 As we passed the monastery, we saw novice monks sweeping and tidying up around their quarters. 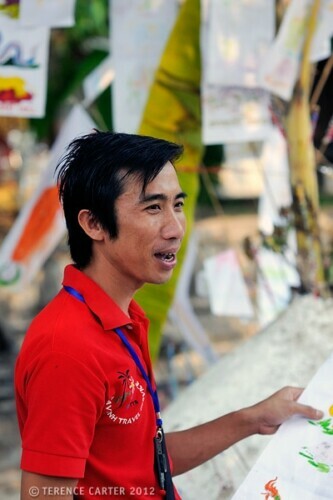 Bounmee explained that most of the boys were from Mekong villages and the countryside, and had come here from around 12 years of age and onwards for the free education. Leaving the bulbous watermelon stupa, we departed for our next destination, passing stairs leading to neighbouring Wat Aham. The Monastery of the Opened Heart, built in 1818, is set in sprawling shady grounds with towering palm trees and two colossal banyan or Bhodi trees. Statues of tigers and temple guardians Ravana and Hanuman, from the Indian Ramayana epic, guard the entrance. 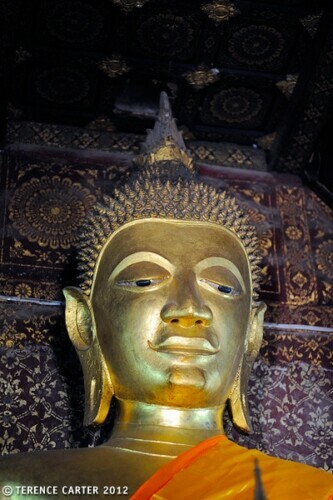 The site is said to have long been a place where the animist worship of spirit guardians and Theravada Buddhism meet. We left Phomathat road and turned the corner into Ratsavong road at the base of Phousi Hill and wandered along the shady riverbank and Kingkitsarath road towards the end of the peninsula. We passed stately antique buildings transformed into boutique hotels and restaurants, and dilapidated wooden and weatherboard houses in shades of blue and green, with peeling paint and corrugated iron awnings. Sleeping dogs laid out front and washing hung in the windows. It was late-morning and it was sweltering and the streets were almost empty. We hiked up a lane and stairs to reach Wat Souvanna Khiri, dating to 1773, a charming complex of buildings in shady grounds that includes a pretty sim with red columns and gold embellishments and a white French colonial building which is now the monks quarters. A couple of locals chatted to the caretaker, but there were no tourists. Although that wasn’t surprising in a city bursting with gob-smacking temples. We crossed the road to Wat Xieng Thong or the Temple of the Golden City, set in tranquil gardens at the tip of the peninsula, where the Mekong meets the smaller Nam Khan. 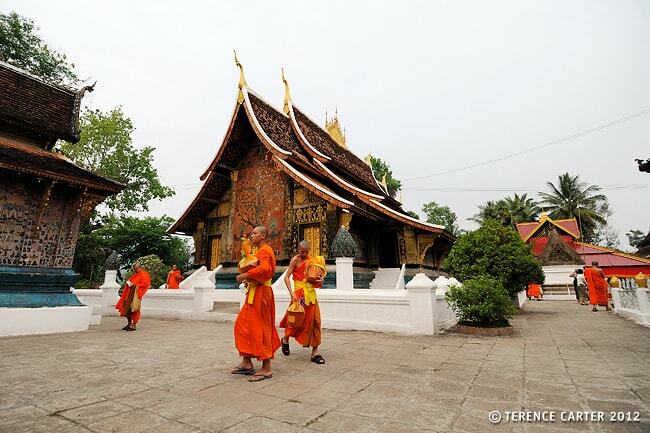 Built in 1560 by King Setthathirath, it is Luang Prabang’s most historically important temple. It was only spared in 1887 by the Black Flag invaders because their leader had spent time there as a young novice monk. Known as the Royal Temple, it was the site of royal coronations, festivals and cremations for centuries, which is why the stupendous, carved, gilded funerary carriage house is crammed with gold Buddhas, intricately carved urns, and a gold cremation chariot decorated with naga heads. It’s the most magical of Luang Prabang’s temple complexes. 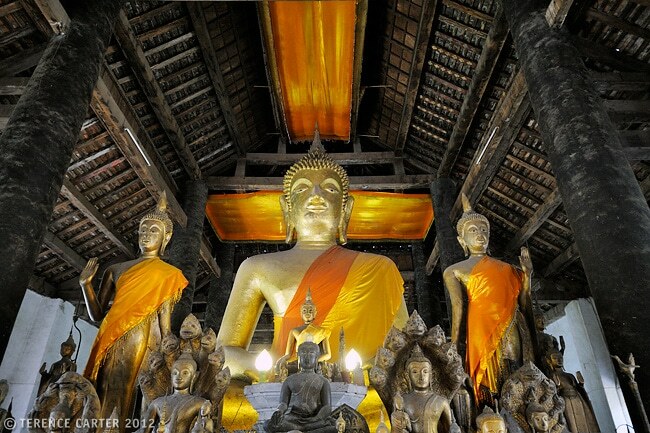 Wat Xieng Thong epitomizes the Luang Prabang Style, boasting a sweeping, high, layered, triple-tiered roof. It has an ornately carved gold entrance, black lacquered walls and pillars covered in intricately detailed patterns and symbols in gold leaf. 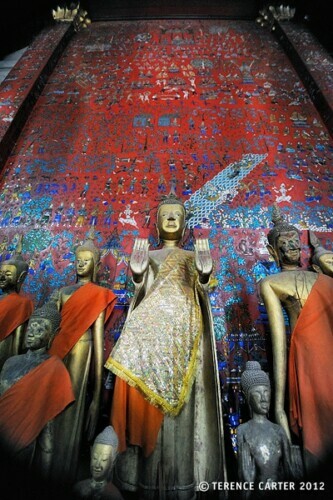 The temple interior is richly decorated in red and gold leaf with a big golden Buddha and on the exterior rear red wall a large flame tree or tree of life has been created from mosaic tiles. Ornamental, bronze lotus buds decorated with green glass mosaic tiles appear to flower around the temple. If that weren’t enough we found even more enchanting buildings behind the sim, including a mustard coloured open-sided pavilion with a seated Buddha, a pink chapel, and a library, all decorated with intricately detailed scenes created from mosaics that sparkle in the light. There are also monk’s quarters, a drum tower, several stupas, and a grand staircase leading down to the Mekong and splendid river views. We had started out early, so by the time we finished at Wat Xieng Thong the sun was high in the sky and it was scorching. It was too bright to take photos and perspiration was beading on our faces and dripping off our backs so we decided to call it a day. We strolled down a shady lane toward the centre of town with the intention of returning at sunset. There was Wat Sop Sickharam, with a colourful stupa, where novice monks studied at wooden tables under shady trees. 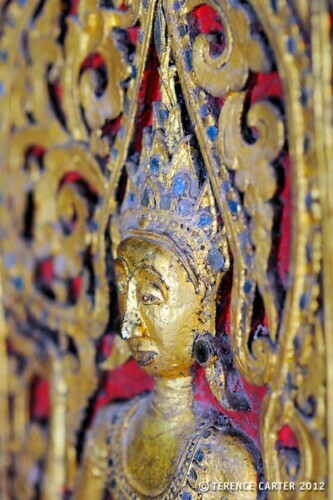 There was the striking red and gold-stencilled Wat Sensoukharam, dating to 1714. We stopped at the colossal gilded red and white Wat Nong Sikhounmuang, built in 1729 but restored in 1804 by Thais which explained the Thai design elements such as the red roof and descending nagas. There was the majestic Haw Pha Bang or Palace Chapel, built in 1963, the resting place and shrine of Luang Prabang’s sacred Buddha image. We passed the neglected-looking Wat Pa Huak or Monastery of the Bamboo Forest, dating to 1861, at the base of Mount Phousi, and the 18th century Wat Mai Suwannaphumaham or New Temple, Luang Prabang’s most dazzling and most lavishly-decorated temple of all. Dress respectfully, which means modestly — skirts and shorts below the knees and sleeves. Don’t wear singlets or halter-neck tops. If you must, take a sarong to wrap around your shoulders. Remove your shoes, which you can safely leave on the stairs, before entering the temple. If you meet a monk or novice monk, feel free to chat as they’re usually eager to practice their English, but women need to ensure they don’t come into physical contact. Visiting hours for wats are generally from sunrise to sunset. The most important temples cost 20,000 kip to visit (other less-visited temples are often free); donations are welcome too. Take water and wear a hat and sun protection. You can organize a temple walking tour or a guide to take you just about anywhere through Naga Express Travel www.nagaexpresstravel.com. Don’t feel like you need to tick off every temple. We prefer to spend more time taking in a few rather than running around to a dozen and forgetting what we’ve seen. 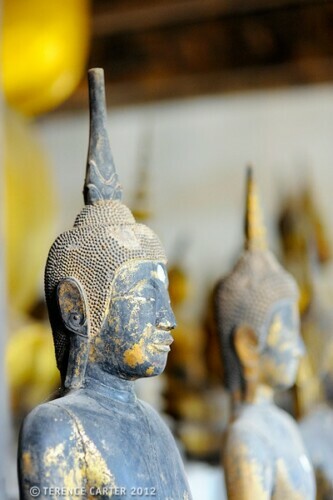 Have you been to Luang Prabang? How many temples did you see? Which were your favourites? Did you tick them all off or focus on a few? 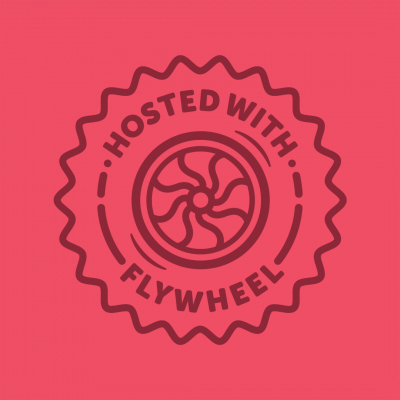 Any tips for our readers?